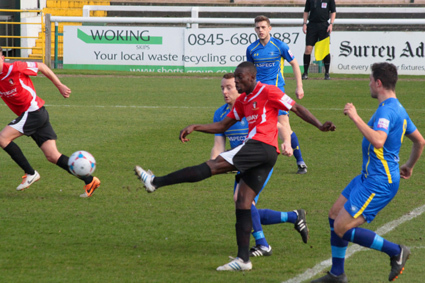 Hayes & Yeading took maximum points for the first time in 2014 with a hard fought victory against a physical Concord Rangers side at Kingfield courtesy of a stunning first half volley from on loan Kidderminster striker Freddie Ladapo. United, unusually fielding the same starting XI as the previous game, got into their stride quickly and created a good opening in just the fourth minute. Samir Bihmoutine chipped the ball forwards to Pat Cox, who nodded the ball back down to the left sided midfielder who fired for the near post but was denied by Concord keeper Jamie Butler's outstretched boot that deflected the ball wide. Rangers striker Zane Banton was nearly the beneficiary of United's Ben Gerring helping on a long throw from Jack Lampe but he hooked the ball over the United goal from inside the box. Two minutes later United had the ball in the net when Jack Mills' deep corner was headed high in the air by Gerring and although Cox leapt and headed home he was adjudged to have fouled Butler in the process. Another long throw from the visitors gave an opening to Steve Cawley who received the ball at his feet but could only find the chest of Mikhael Jaimez-Ruiz with his shot on the turn, the United stopper holding his effort. Four minutes later and with the last real attempt on goal of the half, United took the lead. Bihmoutine's cross from the left was chested past his marker by Ladapo before thrashing a volley from just inside the box that gave Butler in the Concord goal no chance. Having started the better in the first half, United were again a little slow out of the blocks in the second and could potentially have been pegged back very quickly when a cross from the right side found an incoming James White at the far post who was only denied by the alertness of Frankie Merrifield who put in a perfect tackle to stop him getting his shot away. Around the hour mark Butler denied United a second with the save of the match. Mills long throw saw Cox manage to get a goalbound flick on the ball at the near post despite being squashed between two markers only to be denied by a superb reaction save from Butler who tipped the ball around the post. Bihmoutine worked space for a shot only for a defenders boot to take and sting out of it and then at the other end a Matty Harriott tackle won in the area saw the loose ball run to Tony Stokes but he fired over Jaimez-Ruiz's goal. Concord went close again shortly after when a long Butler punt was lofted into the box by Stokes but again the effort was too high, this time from Cawley. As we entered what was to become 9+ minutes of time added on, both sides could and maybe should have found the net. First to fail when it looked easier to score were the visitors two minutes into the extra minutes when a cross from the right picked out central defender and skipper Steve King who was unmarked at the far post, but somehow he headed wide. The final chance fell to United in the sixth extra minute when Ladapo collected a Luke Williams cut back and with just Butler to beat aimed for the near post only for the ball to go inches wide of the post before the final whistle eventually brought the game to an end and a vital three points had been well earned by Phil Babb's side. 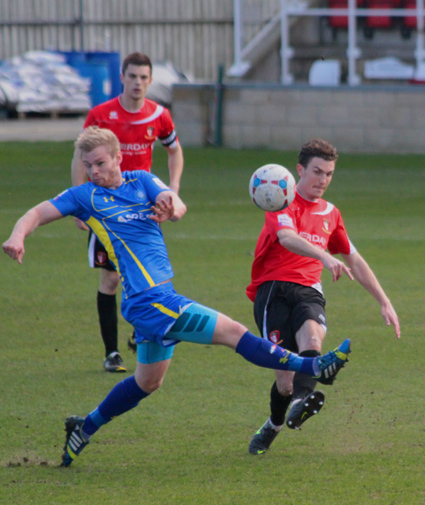 Match Photos by Ray Peploe. 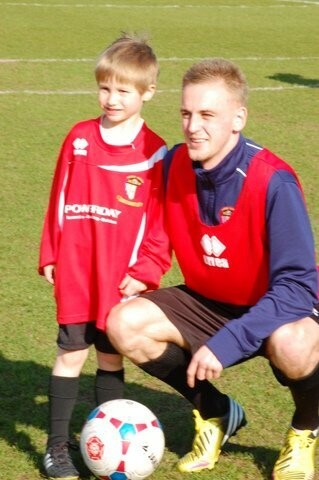 Pictured right courtesy of proud grandad Brian Matthews is matchday mascot Luke Corbett on his 6th birthday alongside his favourite player, Luke Williams.